Lenovo partnered with Qualcomm and Microsoft in order to provide always on 4G LTE connectivity to an ultraportable 2-in-1 convertible powered by the Snapdragon 835 SoC running Windows 10 S. It features a detachable keyboard and a stylus, comes with 4 GB of RAM and 128 GB USF storage, and it is very light at only 2.93 lbs. Rather than sticking to the 2-in-1 convertible approach that usually leaves the keyboard unprotected in tablet mode, Lenovo continues to promote the detachable system. This way, the keyboard does not get accessed by mistake in tablet mode, and users can easily reattach the keyboard when needed, without the use of complicated swivle hinges. At CES 2018 this year, Lenovo is presenting the latest member of its Miix family – the Miix 630 2-in-1 mobile device that benefits from the detachable approach, which combines the productivity of laptop with the always connected functionalities of a smartphone. The Miix 630 integrates an always on 4G LTE modem that provides uninterruptable network connectivity, so users do not have to rely on WiFi hotspots with limited area of effect, making it essentially act as a smartphone. Lenovo equipped the Miix 630 with the powerful Qualcomm Snapdragon 835 SoC that was specifically tuned to work on the Windows 10 S operating system. The system also comes with 4 GB of RAM and 128 GB of UFS storage. 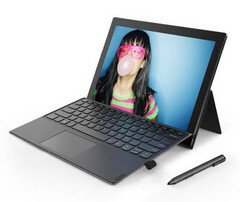 The tablet part comes with 12.3-inch 1920 x 1200 touchscreen, which makes extensive use of the included pen with 1,024 sensitivity levels, allowing users to draw, sketch and annotate via the Windows Ink platform. The detachable keyboard comes with backlit buttons and a precision touchpad. Even with the keyboard attached, the Miix 630 has a profile of just 0.6 inch and weighs only 2.93 lbs. Lenovo will begin shipping of the Miix 630 in the second quarter of 2018, and the MSRP is set at $799.99 (including the keyboard and pen). The Miix 630 runs on Windows 10 S, making it ideal for users who want consistent performance and streamlined security by running apps exclusively from the Microsoft Store. If you prefer the familiarity of Windows 10 Pro, the Miix 630 allows you to upgrade at no cost so you can choose the operating system that fits your needs.